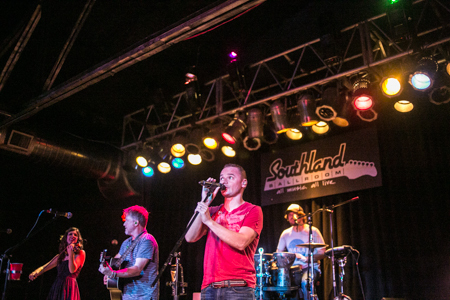 Southland Ballroom, in the Glenwood South downtown Raleigh district, welcomes Music Maniacs looking for live music. The venue is located right behind ComedyWorx off of N. West Str. and holds about 350 people. When I walked into the venue I felt like I was walking into a warehouse. 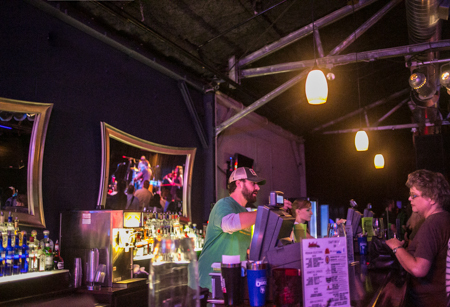 Once you pass through admission, you enter into a large room with a bar lining a long wall and a few booths for comfortable seating around a table to enjoy drinks from the bar. The bar features craft beers from Carolina Brewing Company, Lonerider Brewing Company and Big Boss Brewing Company and a large selection of mixed drinks. The venue also has some outdoor patio seating. The venue has a rustic but casual feel with intimate lighting and a disco ball hanging from the ceiling. And the stage is lit up with many colorful lights to spotlight the musicians perfectly. 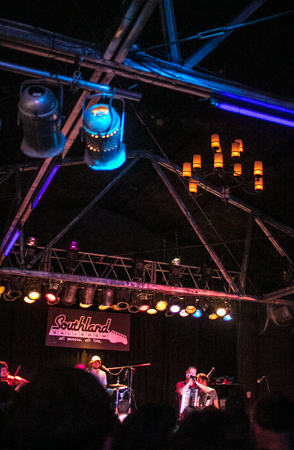 Southland Ballroom mainly hosts touring bands of the electronic, folk, bluegrass and punk genres. On Thurs. 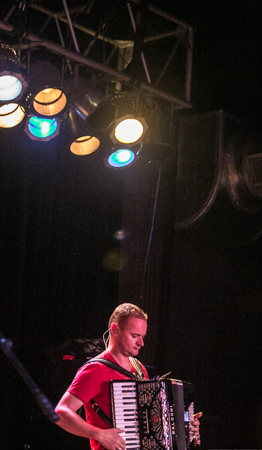 they welcomed Gaelic Storm to their stage, which stopped in Greater Raleigh on their current U.S. tour. Gaelic Storm is a Celtic-rock band that consists of Patrick Murphy on lead vocals, Steve Twigger on lead guitar and vocals, Ryan Lacey on percussion, Pete Purvis on bagpipes and Kiana Weber on violin. Gaelic Storm originated in Santa Monica, Cali., when Patrick and Steve collaborated starting in 1995. They started their music career by playing for friends, but then appeared in the movie Titanic (1997) as a Celtic party band, which increased their popularity, triggering them to start recording their music. Gaelic Storm has produced nine records containing ballads and anthems that tell stories about their memories of their homes in Ireland. 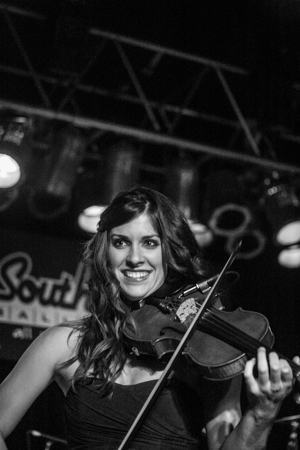 The group has diverse backgrounds in music which has lead them to incorporate different instruments in their shows such as mandolin, Irish whistle and accordion. The band highly encouraged their listeners to sing and clap along with their songs during their show. Southland Ballroom was an excellent venue to experience Gaelic Storm, with its laid back feel, top-notch sound and entertaining lighting. 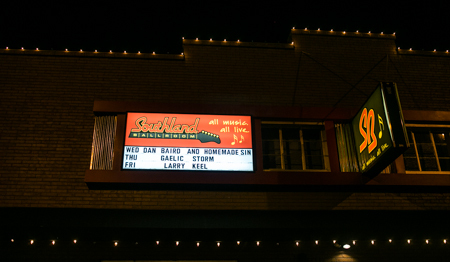 Southland Ballroom has music almost every night of the week and hosts many great bands like Gaelic Storm. You can check out their schedule here. 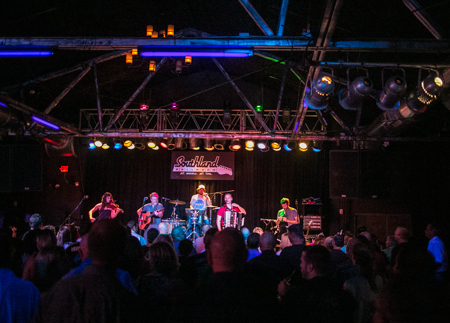 For a full schedule of Greater Raleigh live music events, check out Music Mania on visitRaleigh.com!